As promised in my last post, here is the beginnings of a post on the operating safety case (OSC) which has been introduced by the CAA in the revised CAP 722 publication. I will try to be as accurate as I can, but as always there are a few grey areas so please contact the CAA for final confirmation! Please consider this post a work in progress! The idea of the OSC is that it allows commercial drone operators in the UK to apply for an annual exemption to your standard permission that allows you to operate outside the limitations of your standard Permission for Aerial Work. Previously, exemptions were issued on a case by case basis, which has led to an almost unmanageable workload. The most obvious example is it is currently not permitted to fly a 7-20Kg drone in a congested area. This has led to the dangerous practice of weight-stripping; running fairly heavy drones on smaller battery capacities and stripping unnecessary (!??) weight in order to bring a drone below 7Kg (which DOES include batteries by the way, whatever people try to tell you!). A case in point here is the DJI S900 which naturally and comfortably comes in somewhere around 7.5Kg with a Zenmuse and GH4 with a sensible amount of batteries. I find it very hard to justify weight-stripping in order to claim that a machine running with dangerously low battery redundancy is now safer! The operating safety case would allow you to submit procedures for operating the 7-20Kg machine within the congested area. In order to do so you will have to incorporate extra risk mitigation in the design of your aircraft and/or through your operational procedures. A congested area is defined by the CAA as “any area of a city, town or settlement which is substantially used for residential, industrial, commercial or recreational purposes”. Now, technically that means a town-based golf course is a congested area. This makes sense if you are flying a 747 but probably not when flying an S1000. But, whatever we think, those are the rules. The OSC is not limited purely to 7-20Kg could also be used to apply for reduced separation distances across the 0-20Kg spectrum., increased working height, EVLOS etc. The idea is that the CAA is moving towards a “concept of operations” (ConOps) approach so that the mass boundaries themselves become relatively unimportant and the key aspect is risk. As you can see from this graph, the right-hand side above 20Kg is irrelevant to most users at present. So, basically, if you are running a Phantom in a farmer’s field in Norfolk the risk will probably fall into category A. If you are running a 19.9Kg machine beyond line of sight in central London it will be C. It is likely that most people’s operations will fall into category A or B.
I’ll pick that up again later. The next stage of the OSC is the paperwork you need to produce to submit to the CAA. The CAA have provided templates in the appendices B-D of CAP 722. Volume 1 is effectively what we have been writing for 0-20Kg operations up until now. If you wish to apply for a standard PfAW, it is all you need to complete. Full information can be found in appendix C of CAP 722 but the CAA want you to fully understand your machine, its limitations, how it functions and how it can be made as safe as possible. Volume 3 gives details of your safety management beyond the aircraft itself and includes sections for risk assessment and self assessment. So, effectively, the idea is to assess as fully as possible the risks associated with the operations you wish to include in your OSC and also to assess the limitations of your crew and procedures. A template is available in appendix C of CAP 722. As you will be applying for an annual OSC it is probably best to try to envisage what you are likely to want to do and to think generically rather than too specifically at first, so think of the type of location you are going to fly at rather than specific locations. Are there any common safety issues between sites. for most people it will tend to be proximity issues that need to be risk assessed. 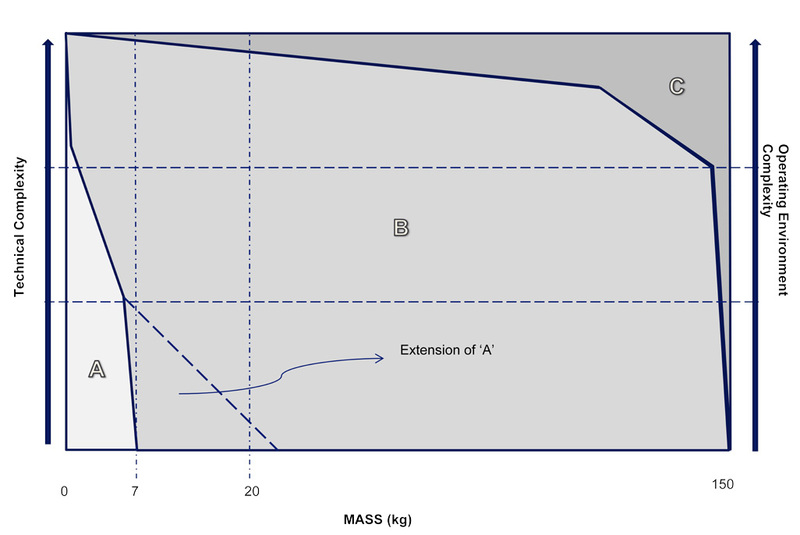 Going back to the graph from earlier (figure 1), the aim of your volumes 2 and 3 should be to develop equipment and/or procedures that mitigate the risks associated with either the increased mass or increased environmental complexity. I will try to add to this soon to give more detail on risk matrices and the self assessment method preferred by the CAA. I’m afraid we can’t give direct assistance with individual operating safety cases at the moment as every case is likely to be different and the CAA really want you to take ownership of the process. This information is as correct as we can get it at the time of publication but may be out of date by the time you read it so please check current guidelines and feel free to contact us if you need more information. As Always Elliot, clear and concise!